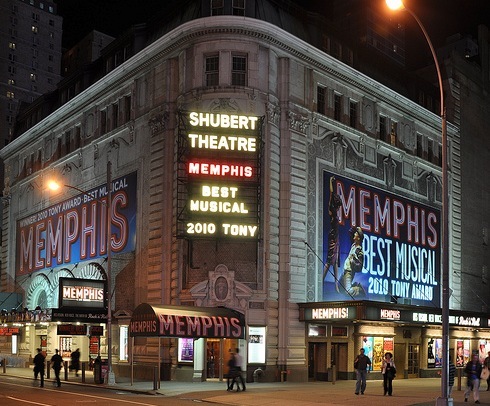 The Shubert Theatre, home to the Broadway musical "Memphis," lit up the night April 26. 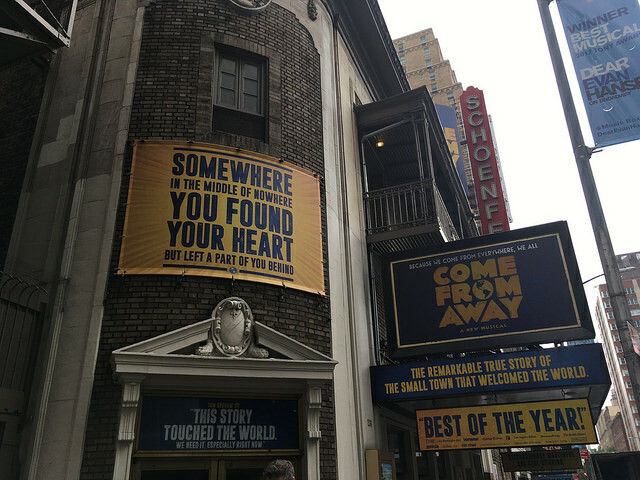 The Broadway Green Alliance has overhauled all Broadway theatre marquees with energy efficient bulbs. On 51st street, Glinda the good witch makes a perky entrance via her bubble in “Wicked” while six blocks down, the disfigured and tormented title character of “The Phantom of the Opera” makes a chandelier crash onto the stage below. It’s opulent. It’s fanciful. It’s Broadway. Yet between recreating the land of Oz and a 19th century opera house, Broadway has managed to look past the bright lights and find unique ways to go green. The Broadway Green Alliance, an industry-wide network of theater professionals, encourages the adoption and implementation of environmentally friendly practices. Members of the New York theater community formed the organization in 2008 after sharing ideas for greening activities. Jennifer Hershey, head of the group’s venues committee and Vice President of Building Operations for Jujamcyn Theaters, said the transformation began on the outside and slowly worked its way in. “Our primary goal was to change the light bulbs in all of the exterior marquees of our theaters,which is an absolutely tremendous goal because there were 39 theaters that we were trying to get onboard,” Hershey said. Within a year, the organization replaced most of the incandescent lights with more energy efficient bulbs. “We’re saving around 80 percent of energy usage,” said Deull, adding that changing the bulbs is costly at first but worth the investment. Other changes include using re-chargeable batteries in microphones and swapping the bleach used to mop theater floors for more diluted, eco-friendly options. The group’s green efforts also invite the participation of theater patrons; recycling bins have been placed throughout venues to collect discarded playbills and box office ticket envelopes are now made from partially recycled paper stock. But initial investment to go green could be an obstacle for smaller theater companies. Paul Brunner, assistant professor and head of the Theatre Technology department at Indiana University, added that green methods are already used in the theater. “The construction and deconstruction (strike) of scenery is meticulously planned to maximize the salvaging and reuse of materials,” Brunner said. Still, it can be difficult at times to convince people within the theater to go green. Yet Hershey said the Broadway Green Alliance remains steadfast in its mission.